Did you see MaMa's guest blog over at In Between Laundry? If not, you can always find the recipe for Lentil and Sausage Soup here on our site. 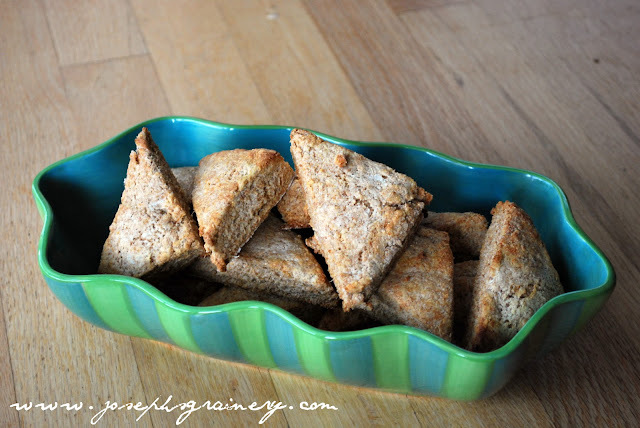 MaMa and I thought it would be fun to share a recipe for Honey Whole Grain Biscuits today, since they go so well with the soup we shared with everyone yesterday! Honey Whole Grain Biscuits are the perfect companion to a nice warm bowl of soup! Directions: Preheat your oven to 400 degrees. In a large bowl, whisk together the flours, baking powder & soda and salt. Using a pastry cutter (or a fork), cut the butter into the dry ingredients until it is the size of peas. In a separate bowl, whisk together the egg, buttermilk and honey and then add to the flour mixture. Mix together until the dough is evenly moistened. Using your hands, work the dough into a ball until the dough comes together. Turn the dough onto a lightly floured surface and press it out into a square that is 3/4 of an inch thick. Cut the dough into smaller squares and then cut those squares in half into triangles, so they look like the biscuits in the photo above. Bake at 400 degrees for 20 minutes.